Transponder immobiliser systems were introduced to vehicles in Germany in about 1995. The rise of car theft and the market for cheap second hand parts led the decision to increase the difficulty in sourcing “hot” parts and cheap cars. The Japanese came on board early with their vehicles but did not go down the route of rolling code systems like Germany. Mitsubishi and Toyota were among the first to incorporate Transponder based immobilisers into models such as Lancer, Magna,Camry and Corolla. 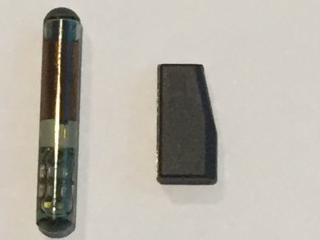 There are two main types of chips used in car keys, as pictured here, there is a glass chip and there is a carbon chip. These chips are programmed with data or binary code that the cars ECU or BCM needs to receive before the car is allowed to start. The mechanism that is used to transfer this data from the chip to the immobiliser is called a reader, generally a copper coil that sits around the ignition lock. If the key is lost or the chip is damaged the process of resetting the system and making new transponder chips can be a costly and time consuming exercise. As well as transponder chips many manufacturers are now incorporating pin codes as part of the cars security. This means that to communicate with the cars system in the event all working keys are lost or even to program spare keys, a four or 5 digit code may be required. A bit like getting money from the ATM, if you don’t have the pin code you won’t get money from your bank. There are many tools on the market now that allow a trained Automotive Locksmith to make new or replacement keys to 90% of vehicles on our roads today. Before transponders making keys to cars was a specialised skill and not all locksmiths performed this challenging service. Today more than ever before the Automotive locksmith needs to know the system he or she is working on and the knowledge base is broadening as each new model hits our streets. Pick Me Car Locksmith Adelaide has spent many thousands of dollars and invested many man hours to provide one of the best Automotive Locksmith services in Adelaide. We are constantly upgrading our equipment and honing our skills to help our clients overcome any unforeseen mishap with their car keys and remotes. We carry a full range of transponder chips and key blanks to ensure that we can get our customers back on the road again as cheaply and as quickly as possible. Car keys are expensive these days! Some keys can cost as much as $700 just to buy the blank key and that’s before any cutting or programming is done. 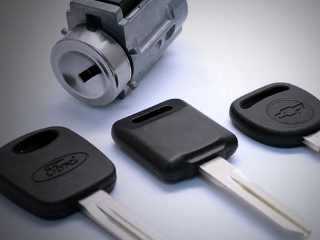 Manufacturers are using the fact that many cars will only recognise the original factory key and remote and there may not be an aftermarket alternative. The expense is a result of the car manufactures deciding to incorporate their vehicles remote central locking system into the actual key head. Many of these expensive keys are made in china or taiwan and the materials used are inferior despite the high cost to the end user. Keys can break easily because for the most part they are made of plastic. Fortunately there are quite a number of “key shells” coming onto the market now. If a key snaps or part of its plastic breaks it is possible there may be a shell available to fix the problem at a fraction of the cost of genuine replacement. Pick Me Car Locksmith Adelaide carry an extensive range of shells and we can cut out your keys transponder chip and swap the internal workings over for you at your home or work. As long as the buttons on your remote still work you can end up with a key that looks better than your old key. Be careful if you intend to do the swap yourself because the chip inside your key is usually glued in and if you damage the transponder chip your car will not start. Pick Me Car Keys Adelaide have access to quality suppliers of key shells and we can even source hard to get brands such as Renault, Peugeot and BMW. We always recommend that you keep a spare back up key for your car especially if it was manufactured after 2005. 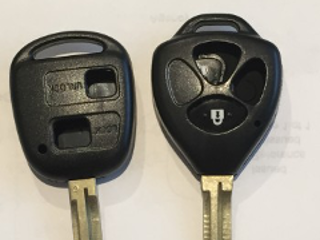 If you notice your remote key is getting a little worn or cracked take action to fix it before it’s too late. Avoiding a disaster or inconvenience with your cars key is always the best way to go, give us a call before things get worse. We are fully equipped and mobile to provide a key cutting and shell swap service at no extra cost, we will come to you. Locked out of house? Locked out of car? Pick Me Locksmiths Adelaide are asked on a daily basis to help customers who have locked their keys in their home, car or office. Most people are a little embarrassed to admit it has happened to them and because its not a common event for them they are unsure what the process is to get their keys back. The fact is unplanned mishaps happen to us all but its nice to know that there is a Mobile Locksmith you can rely upon in this instance. Pick Me locksmiths have a free 1800 number for you to call 24/7 and our friendly staff will be ready to respond quickly and cost effectively. We can usually be on site within the hour and will open you vehicle or home lock without any damage occurring to your property. We are fully insured and trained and are full business members of the Master Locksmiths Association. We carry specialised tools and equipment to help gain access to your car, home or office. We will generally ask you for some form of identification and require you to fill to our security disclaimer form. We also will recommend we install one of our key safes on your property (as pictured above) Keysafes can save you time, money and some embarrassment next time you lock your keys inside. 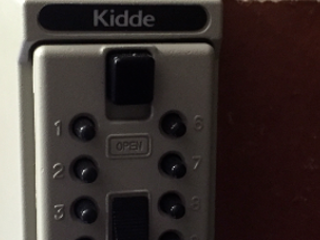 They can be mounted outside in a discreet location and have a four digit number which can be reset easily at anytime. They are great for holiday accommodation that you need to allow access to for visitors or for students that may only be staying at your home temporarily. Another great use is for your elderly relative in case of an emergency where access is required by police, fire or ambulance. They retail for $75 and installation is available for $70 across Adelaide. Pick Me locksmiths are available anytime to discuss they supply of the key safe and any issues relating to its use and safety. 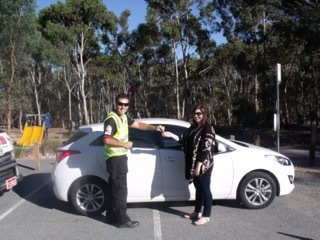 If you are an RAA member did you know that you are entitled to a discount when using a locksmith to open or make keys to your car? We all know that the RAA provide an excellent service when it comes to locking the keys in our cars or we run out of petrol or our battery goes flat. There are 3 levels of membership – Standard, Plus and Premium and each level of membership comes with a different level of cover attached. With either level of cover you are entitled to a locksmith service once a year with a $50, $75 and $150 rebate available if you present your receipt to the RAA. If you have lost or damaged car keys you can call your own locksmith and get a quote to provide you with service then simply deduct the amount that relates to your level of RAA membership to give you what you will actually pay. Pick Me Locksmiths in Adelaide are owned and operated by Richard Smith, a Master Locksmith with over 30 years experience. Richard worked for an RAA locksmith contractor for over 10 years and has seen and dealt with most car lock and key issues. 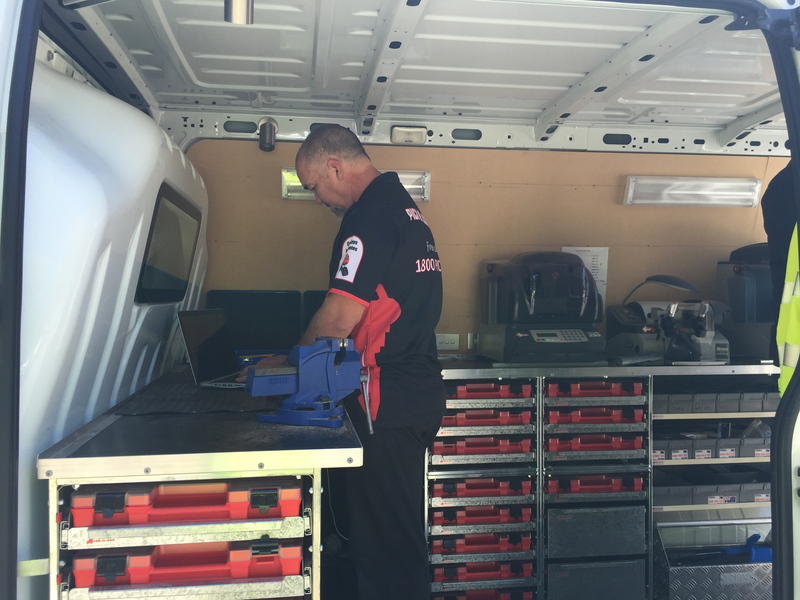 Pick Me Locksmiths have dedicated mobile locksmith vans that can open, make keys and remotes and repair most makes and models of car locks and keys. A reputable automotive locksmith has many skills that will help you get back on the road quickly and at a fraction of the cost of towing your car to a major car dealership. We can repair or replace damaged or broken keys and remotes on site on the same day and car ignition locks and door locks can be replaced also. These days a specialist auto locksmith such as Pick Me Locksmiths in Adelaide have sophisticated tools and equipment specifically made to deal with modern vehicles locking and security systems. Most vehicles these days are computers with wheels and have fully integrated immobiliser systems that require a good degree of technical knowledge and expertise. Pick Me Locksmiths always try and keep up with the latest developments in car key technology and have invested in tools and equipment required to work on current models. So next time you need a car locksmith for your car lock or car key problems and you have an RAA membership, give us a try and we can give you a competitive quote. We will also help you to get your entitlement from the RAA and together we will save you money and time. Car dealers can only supply consumers with original manufactures keys which can cost up to $500 each and take up to two weeks to order in. In most cases the expense and additional time of ordering keys and remotes through a car dealership is not necessary. Pick Me Car Keys Adelaide have mobile workshops that can come to your car and make spare or new replacement transponder keys for a fraction of the cost of genuine manufacturers keys. Although your original key may have a remote on it, many times this remote only serves to lock and unlock the doors as a matter of convenience and not for the security of your car. Pick Me Car Locksmith Adelaide have access to the key blanks and the transponder chips that will allow us to cut and program a spare key for your car from as little as $88. We specialise in automotive locks and keys and have equipped ourselves with the very latest tools and machinery to help you quickly and for a lot less money than a car dealer. If your interested in our services or just have a question about your car keys and remotes, give us a call on our free call 1800 7425 63 anytime. If you’ve lost your car keys, or simply need a replacement, visit Pick Me Locksmith or call 1800 Pick Me for a FREE quote. Pick Me Locksmith, can provide you with a new car key at half the dealer cost.